Arising in the uterus, fibroids are the most common female pelvic tumor. 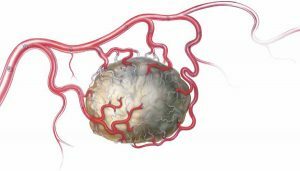 They are benign tumors made up of smooth muscle cells and fibrous connective tissues. They are most common in women of reproductive age. Prevalence increases with age and hormonal exposure. The true incidence is not known since most are asymptomatic. However, there are some reports that up to half of all women of reproductive age have fibroids. If fibroids become symptomatic, they can significantly affect the quality of life. Most fibroids are asymptomatic and require no treatment. Treatment depends on severity of symptoms, age, size, location, and reproductive plans. Hormonal therapy is not usually effective. 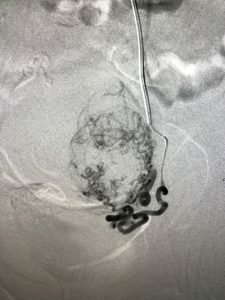 Many patients are treated with hysterectomy which is the surgical removal of the entire uterus. 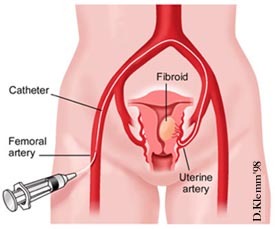 Another surgical option is myomectomy which is the surgical removal of individual fibroids. 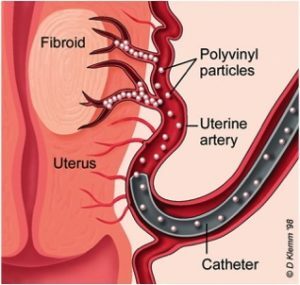 As an alternative to major surgery, uterine artery embolization (UAE) is a minimally invasive procedure performed by an interventional radiologist to help control the symptoms of fibroids. UAE is a minimally invasive, uterus preserving procedure performed by an interventional radiologist under IV sedation. A small catheter is placed into a small artery in the upper leg through a tiny incision. Through this small catheter, tiny round beads are injected into the arteries that supply the uterus and fibroids under x-ray guidance. These small beads stop the blood flow to the fibroids, causing the cells of the fibroids to die and the fibroids to decrease in size. Most patients are admitted overnight for observation and pain control though intravenous medications. The majority of patients go home the next morning with oral pain medications and resume normal activities over the next several days.